The reliably Republican state played host to an action-packed March 1 primary and gave the GOP primary field one of its last men standing, then grappled with Trump's nomination. For those obsessed with Texas government and politics, 2016 was filled with big news, from the somber (the ambush of police officers in Dallas) to the absurd (University of Texas students toting dildos to protest the new campus carry gun law). And then there was the election. 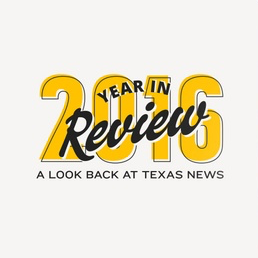 Here's our roundup of the year's most memorable Texas stories. It was a wild presidential race across the country, culminating in Donald Trump's victory over Hillary Clinton. Safely Republican Texas, often a footnote in presidential elections, was no exception. The state played host to an action-packed March 1 primary, gave the GOP primary field one of its last men standing in U.S. Sen. Ted Cruz and saw its Republicans grapple with Trump's nomination time and time again. It all culminated in Trump carrying the state by 9 points, the closest margin in two decades. Now Texas Republicans are facing a new, unexpected political reality: governing in Austin and Washington under a fully GOP-controlled government. Some of those in the Texas GOP will be more involved than others, with speculation still running rampant toward year's end about who could wind up in Trump's administration. The Texas primary was uncharacteristically early this year — March 1 — giving the state more influence in the nominating process. It also was part of a group of mostly southern states that held their contests that day in what was dubbed the "SEC primary." The timing brought a national spotlight to the Lone Star State in the days leading up to March 1, especially for Republicans. A GOP debate was staged the Friday before the primary at the University of Houston, where Cruz and U.S. Sen. Marco Rubio of Florida battled to become the chief alternative to Trump. Cruz ultimately won his home-state primary by a massive margin, but the victory did not come without some work. Cruz spent the day before the primary holding rallies across the state with Lt. Gov. Dan Patrick and Gov. Greg Abbott, who endorsed Cruz just under a week before the contest. There was much less drama in Texas on the Democratic side. Former Secretary of State Hillary Clinton defeated U.S. Sen. Bernie Sanders, I-Vermont, by a nearly 2-to-1 margin. Cruz's campaign came to an end May 3 after a devastating loss to Trump in the Indiana primary. The defeat essentially paved the way for Trump to become the GOP nominee, especially after the only other remaining candidate, Ohio Gov. John Kasich, bowed out a day later. Cruz had gone all in on the Hoosier State, camping out there in the lead-up to the primary in a last-ditch effort to blunt Trump's momentum. In the final weeks of his campaign, Cruz sought to out-organize Trump in various states so he could prevail in the event of a contested Republican National Convention. Cruz had nonetheless beaten the long odds that were given to him in March 2015, when he became the first major candidate to enter the race for the Republican nomination. He went on to win nominating contests in 11 states, including the all-important Iowa caucuses, and emerge as the chief rival to Trump. Once Trump secured his party's nomination, he did not garner uniform support from Texas Republicans. Some, like Patrick, quickly got on board, while others, such as some members of the congressional delegation, were slow to extend their support or did so without much enthusiasm. Cruz became the poster boy for the Texas GOP's ambivalence toward Trump. The senator pointedly declined to offer any support to Trump during a primetime speech at the Republican National Convention, causing an uproar as he instead encouraged delegates to "vote your conscience." It was not until two months later that he endorsed Trump, saying his conscience had led him to do everything he can to stop Clinton, among other things. 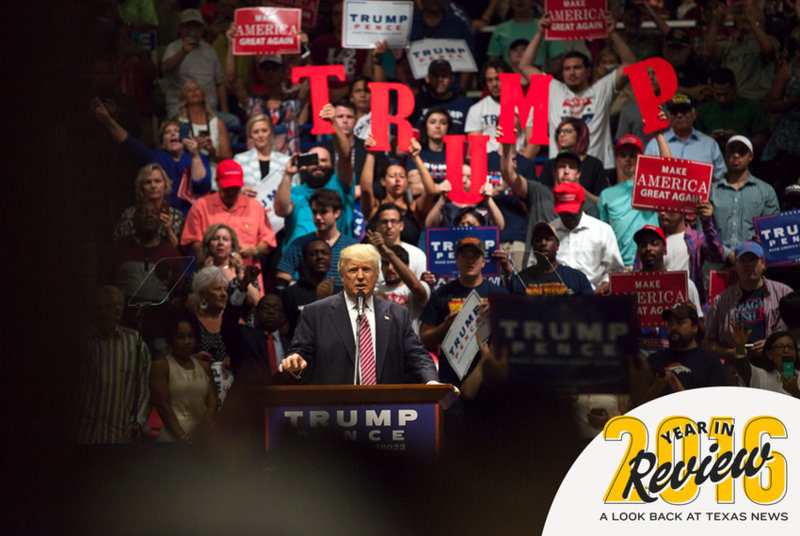 Even in the home stretch of the presidential race, not every Texas Republican was behind Trump. U.S. Rep. Will Hurd of Helotes, running for re-election in the state's only competitive congressional race, fully disavowed Trump after the October release of a 2005 tape showing the nominee speaking lewdly about women. Hurd, who had never endorsed Trump, went on to win his rematch against Alpine Democrat Pete Gallego. The Clinton campaign, which had been seeking to capitalize on Trump's weakness in red states across the country, began to put some resources into Texas. It opened offices with the Democratic National Committee, sent running mate Tim Kaine for a few public events and even launched a small, one-week TV ad buy touting the historic endorsement of Clinton by the Dallas Morning News' editorial board. Trump ended up winning Texas by 9 points, the closest margin of victory for a GOP nominee in the state since 1996. It was not nearly as narrow as some polls suggested it would be but nonetheless gave Texas Democrats a bright spot in a presidential election that was devastating for them on the national level. Trump's stunning victory had barely settled in with Texas Republicans before attention turned to who from their ranks could join his administration. The names that immediately came up were some of Trump's most loyal supporters during the general election from Texas: Lt. Gov. Dan Patrick, former Gov. Rick Perry, Agriculture Commissioner Sid Miller and U.S. Rep. Michael McCaul, R-Austin. Some less predictable names have also surfaced in the the transition speculation, including Cruz's. The Texas senator was briefly under consideration to be Trump's attorney general, according to a report, though that job ultimately went to U.S. Sen. Jeff Sessions of Alabama, one of Trump's earliest supporters from Congress. There is still talk Trump could pick Cruz to fill a vacant seat on the U.S. Supreme Court, a prospect to which Cruz seems to have recently warmed. By mid-December, Trump had tapped two Texans for his cabinet. Though he notably passed over McCaul for head of the Department of Homeland Security, he selected Perry to be his Secretary of Energy and Exxon Mobil CEO Rex Tillerson to be his Secretary of State.